Likely a reference to an Airstream Trailer, a famous aluminum luxury vehicle produced by Airstream INC. from the 1930s to the present. Airstream was the brainchild of Wally Byam, who, in the 1920s, created a trailer in his backyard out of tent materials and a car chassis. This sparked massive interest from other holiday-goers, and Byam began to manufacture camping trailers for the mass use. The initial design included a living room, dining room, kitchen, bathroom, and bedroom. 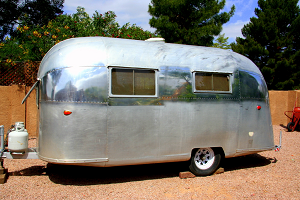 Airstream was one of the only trailer companies to survive both the Great Depression of the 1930’s and World War II. Today these iconic trailers are still widely used, to the point where there are groups that share their love for these trailers and call themselves Airstreamers. "1958 Airstream Pacer" by Tracy27 is licensed under CC BY-NC-ND. N.d. History. http://www.airstream.com/history/, accessed April 21, 2015.